China Ministry of Finance said Tuesday that, starting July 1, the country would cut or eliminate export tax rebates for 2,831 commodities representing 37 percent of the total number of items listed on customs tax regulations. A ministry spokesman said the move was one of a basket of measures to suppress overheated export growth and ease frictions between China and its trade partners. The country will abolish export tax rebates on 553 highly polluting products that consume heavy amounts of energy and resources such as salt, cement, and liquefied petroleum gas, said the spokesman. Tax rebate on exports of 2,268 commodities which â€œtend to cause trade frictionsâ€ will be reduced, he said. The country will scrap the export tax for ten commodities including shelled peanuts, canvas, wood for carving and stamps, according to the spokesman. The new tax rebate system will have five levels, namely 17 percent, 13 percent, 11 percent, 9 percent and 5 percent. The spokesman said the cost of producing the 2,831 commodities would increase as a result of the changes to the export tax rebate regime. This would incite capital investment to move to other â€œhigh value-added and high techâ€ industries. In the long run, this would help the country develop in an economic and sustainable way, he said. Customs statistics show that from January to May, the country reported a trade surplus of 86 billion U.S. dollars, up 83 percent on the corresponding period of last year. 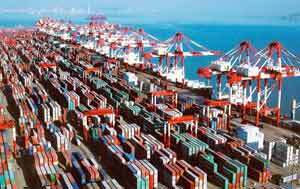 Soaring exports have increased liquidity in the domestic market and added to pressures on the RMB, said experts.